Ms. Katherine Thayer provides students with an overview of Kickstarter. Creativity requires a space. Virginia Woolf argued how A Room of One’s Own is essential for women to pursue their passions, Leo Tolstoy chose the marketplace to craft some of his best work, and the inception of Apple began in Steve Jobs’ garage. Whatever the space, these geniuses, as well as countless others, have flourished due to having an incubator in which to hatch their plots and plans. In this modern world, creative spaces have been taken to a sophisticated level. Many locations are similar to Santa’s workshop in which activity, energy, and idiosyncrasy feed the expressive beast. 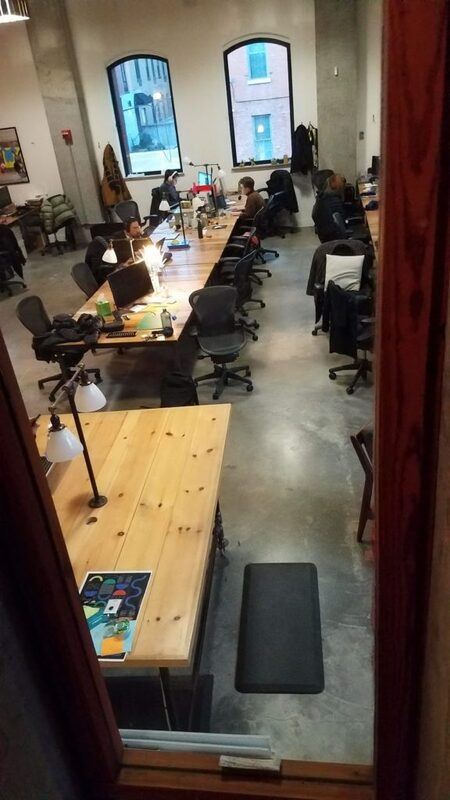 One such spot is in Greenpoint, Brooklyn at Kickstarter headquarters. Here, innovation gathers in order to make the mundane magnificent, the idea being that, in the words of iconic hip-hop group, De La Soul, “Kickstarter is one of those platforms that gives you space to work with people who know you, love you, and support you.” Such nurturing often leads to transcendent work that many of our young people look to create. Students loved exploring the Kickstarter site. With this in mind, WHSAD’s Incubator team, led by teachers Ms. Pia Moos and Mr. Ira Geringer, visited Kickstarter headquarters this week in order to get a taste for the possibilities of a dynamically designed space. During this time, students met with some renowned innovators who provided insights regarding their unique creative processes and how a place such as Kickstarter can provide a base from which students can launch their ideas. The following are accounts from Juniors Premnauth Ramchan, D’Andra Gordon Errin Mickels, and Chandler McLaurin about their visit to Kickstarter. 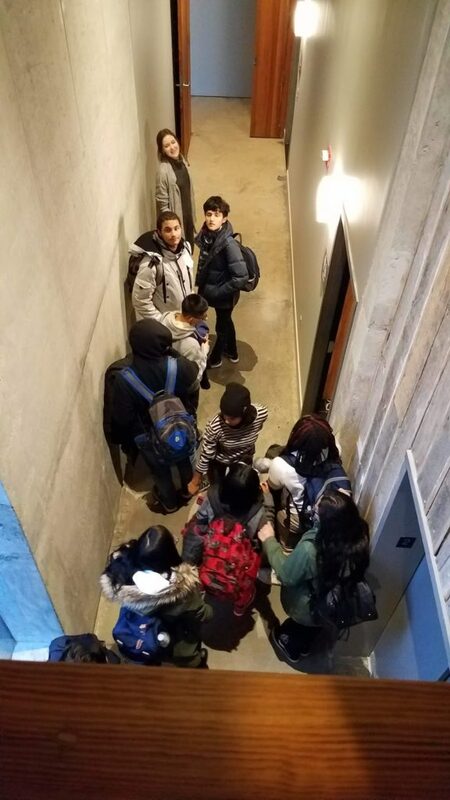 On Tuesday January 15, 2019 The Incubator Club went to Kickstarter in Greenpoint. A cooperation that helped us learn the basics of being entrepreneurs and finding easier ways of forming and creating our own businesses from scratch. 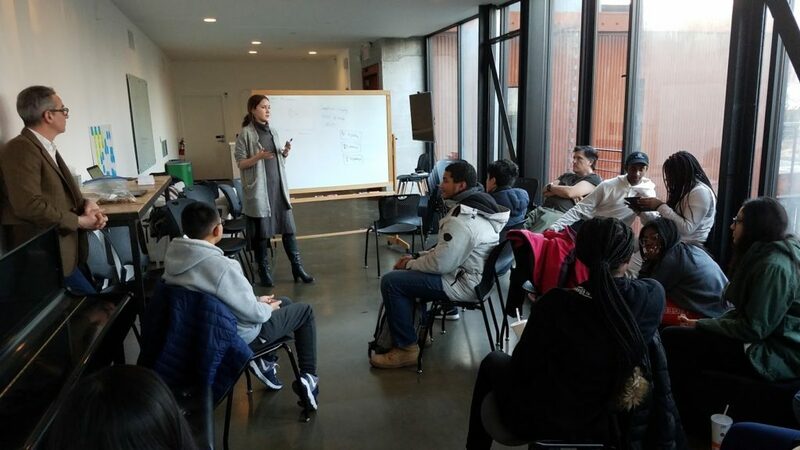 We learned from Katherine Thayer, technological designer for Kickstarter, that Kickstarter can help fund our projects and improve our intellectual concepts of becoming product designers. Some questions we asked included, “What is the central idea of Kickstarter?” “What is your purpose here?” and “How can you help us?” We brought our ideas to the table, talked about skills that we’re capable of developing, and what department would be most preferable for us. They also provided us with information on how to add on to our entrepreneurial progression. Right now as high school students, adding the manufacturing process to the product would be too much of a hassle, but with time and determination, we could also expand the value of our products. The tour of Kickstarter taught us that the organization can be a great stepping stone to our success. The break room provides a serene environment for ideas to flourish. Additionally, Ms. Thayer led us through the facilities such as the library, offices, conference rooms, and the theatre. Their facility was very aesthetically pleasing. The rooms had character and texture. As we walked towards the bathroom, I saw outstanding plants and trees which are coherent to the environment. Stepping into the bathroom was very beyond my expectations. There were a lot of products provided in there such as deodorant, Q-Tips, lotion, and other products that enable those who work in the space to remain feeling at home. The main thing that was absolutely outstanding was the theatre and how the crop of design was elegantly used in there. The Kickstarter work spaces take into account design aspects that foster creativity and comfort. In general Kickstarter had a great open facility where natural light was able to come through. As we were looking out the window from the second floor, we saw benches, chairs, and tables where employees and clients would sit outside on a nice day to do work or eat lunch. The pantry in their work space was so diverse with a variety of snacks and drinks. 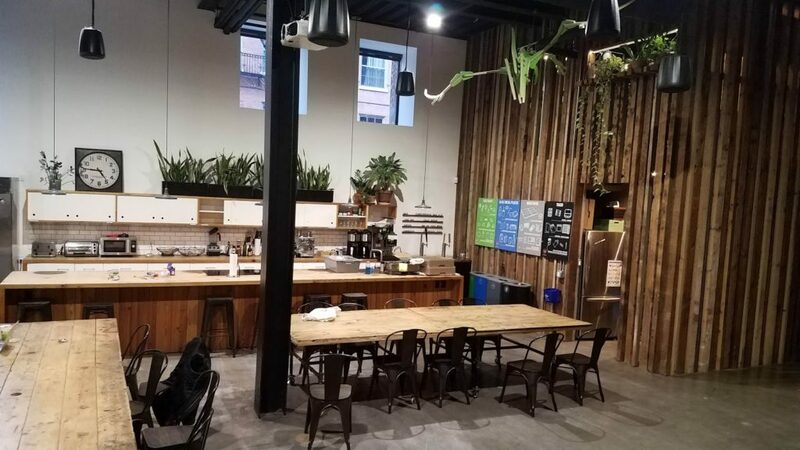 In addition, the most fascinating thing was the design of their work spaces, which give a comfortable modern as well as vintage feeling as soon as you walked inside the place. We were extremely excited to meet people who already have experience of product designing such as Areaware CEO Noel Wiggins and industrial designer Sinclair Scott Smith. These men shared valuable insights regarding their creative processes and what it takes in order to realize one’s vision. They shared valuable insights like building off one’s ideas and that no idea is dumb per se but often can be revised and something always can be added to a project. They also said to use the “World as an Oyster” meaning to use the world as inspiration for a project or anything you want to create. One important thing was to stay focused on one idea to build off. The tour guide showed the group the Kickstarter website and explained the process of how to create and follow through with the Kickstarter, describing the advantages and disadvantages of having and supporting a Kickstarter. For example, if you are a “backer” you are now on a tier based on the amount of money you gave to the provider of the project. Also the Kickstarter can have frauds in which people would just have their money stolen. Another situation that could happen is that the providers will set a goal and a due date. If they don’t make their profit goal but that date the product and the backer will both not receive the created items. Special thanks to Katherine Thayer, Noel Wiggins, and Sinclair Scott Smith for making our visit so rewarding. Additional thanks to Mr. William Harvey for always supporting WHSAD’s Incubator projects.